A downtown riverbank park that links into a planned trail system and provides direct access to the water. Little Turtle Waterway covers 4.75 acres of riverbank along the Wabash River, and includes the Plaza, lawn, trail, and parking lots. The Plaza is the trailhead for a contiguous trail system planned along LogansportÍs two rivers. Another segment is finished, and two more segments are in progress. The Plaza provides access to the river. 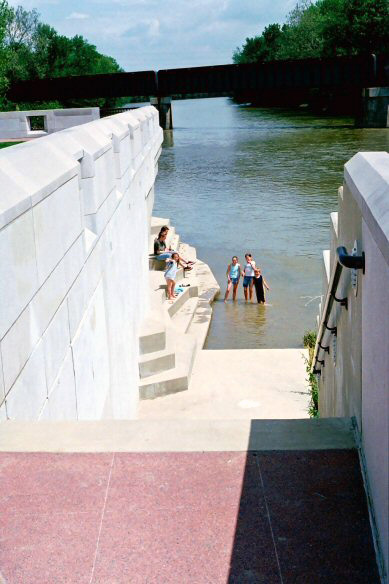 Two stairways, with seating ledges to the side, lead to a lower sidewalk at the Wabash RiverÍs edge. No matter what time of day, some part of the seating area is in the shade. The ledges are also lit in the evening. The ledges are well used in clear weather. Churches have used the lower Plaza for river baptisms. 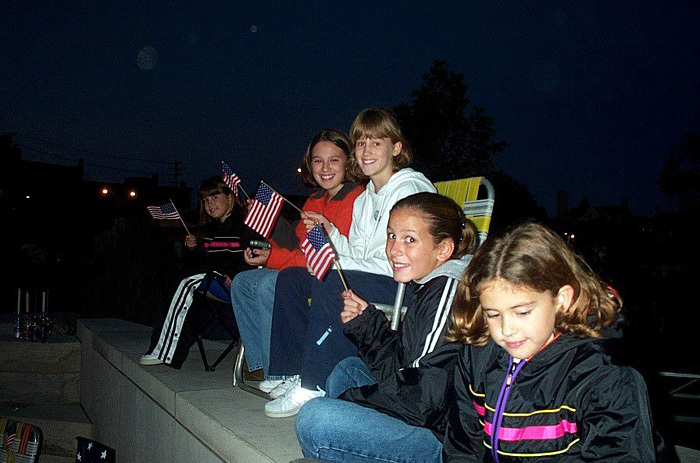 The Plaza has become a popular destination for school field trips because of its interpretation of local history and artful reminders of our natural environment. 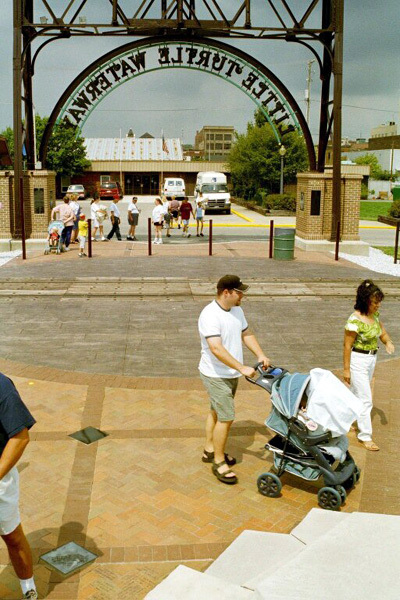 An "engraved pavement brick" program provides an ongoing opportunity for citizensÍ and visitorsÍ expressions to become a permanent part of the park. The small, manicured Plaza has proved an ideal place for weddings and memorial services. 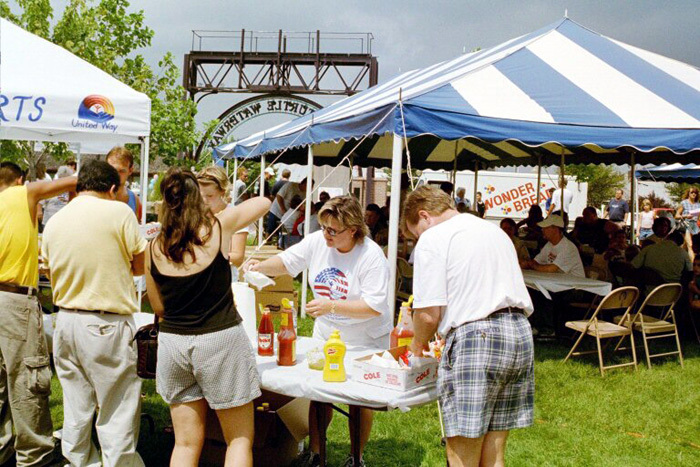 The adjoining lawn area offers a different sort of gathering space, which has accommodated such diverse events as dinner theatres, a motorcycle rally, and circuses. The trail offers five blocks of riverbank walking, uninterrupted by any street crossings. Though it has no lighting of its own, ambient light from downtown is enough for evening users. One church youth group using the trail and Plaza on a Sunday night declared LTW "awesome!" 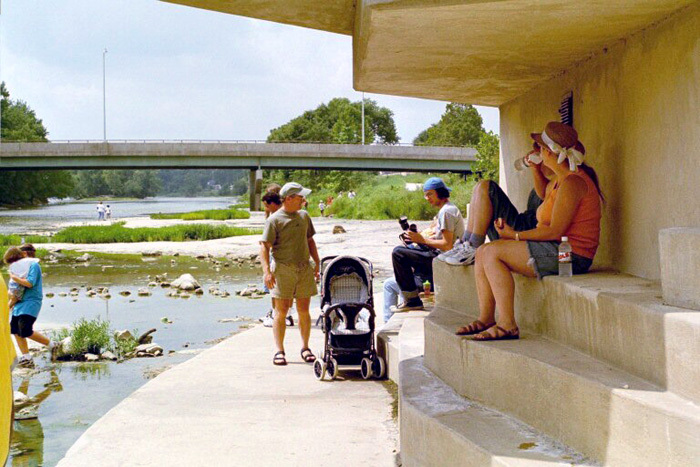 Seating includes limestone ledges of varying heights, a number of iron benches, and concrete ledges of varying depths and heights on adjacent to stairways leading to the river. People bring blankets or folding chairs for events, and there are benches for resting along the trail. The Logansport Parks Department regularly picks up litter and empties trash containers, and gives LTW special attention before events. LTW Corp. members raise money for heavy maintenance such as painting and vandalism repair, or do it themselves. LTW Corp. members also maintain the riverbank, dedicating 12 Saturday mornings a year to eradicating invasive plant species and picking up litter. The upper Plaza and Gateway lights welcome visitors until the park closes at 10pm. Security lights illuminate all upper and lower Plaza areas for the rest of the night. Spotlights cover the trailÍs passage under the Third Street Bridge from dusk until dawn. Ambient light from Melbourne Avenue street lamps and adjoining properties provides low illumination for the lawn area and trail. Little Turtle Waterway has become a year-round host to many activities of the community: ´	Logansport Parks Department sponsors an Easter Egg Hunt with hundreds of children and adults . ´	LoganÍs Landing and LTW Corp. have partnered to present "Moonlight on the Wabash," an evening of dinner theater following a day of free family activities. ´	Weddings take place throughout spring and summer. ´	The annual summer Festival brings over 20,000 people to the park. ´	Emmaus Mission raised money at LTW with a Motorcycle rally. ´	Free lunchtime entertainment during summer months. ´	United Way's annual fall kick-off with a circus performance. ´	Logansport Parks Department brings ghosts and goblins for Halloween. ´	Logansport Civic Players performed Macbeth under a fall full moon. ´	Christmas Festival of Lights where thousands visit in the evenings to enjoy the lighted floats display. Other uses and users include commuters (pedestrian and bicycle) on their way to the west side of town; exercisers using the trail for jogging, walking, or bicycling; river watchers, readers, people meeting friends or traveling with friends; wheelchair users and elderly or frail people; and neighborhood children. 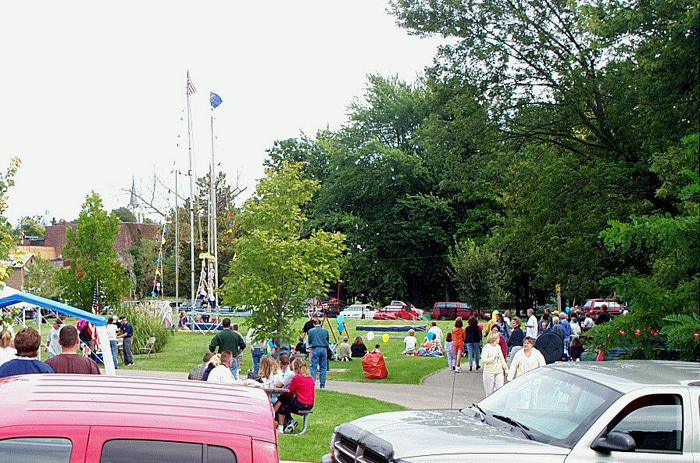 Logansport people are generally friendly, but there is something special about public spaces that make us all equal. People of different backgrounds and abilities mingle freely. Large events attract a wide range of people, including members of our new Hispanic community. Many caretakers of handicapped people also bring their charges, allowing them another way to participate in the larger community. LTW has become one of LogansportÍs gems that we show to out-of-town guests. We have some bragging rights when it comes to Little Turtle Waterway. Grinsfelder, Boezi, Lupke, and Associates prepared a comprehensive Downtown Plan. This comprehensive plan identified the need to create a central gathering point for our downtown. They worked closely with the community through interviews, focus groups, and community meetings. Little Turtle WaterwayÍs flexible design has allowed it to become that focal point. 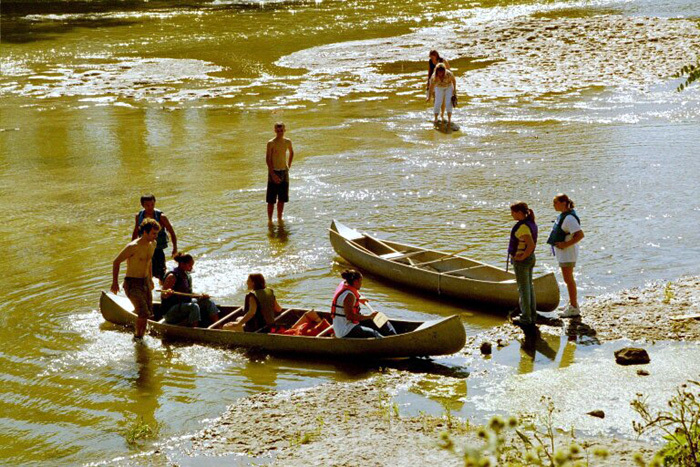 It is used in countless different ways by the community, from families playing in the water to large community events. 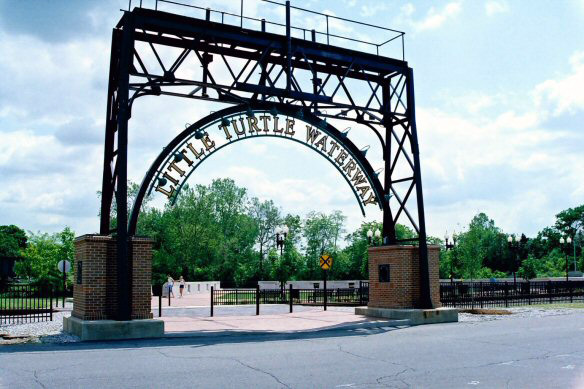 Little Turtle Waterway is an essential element in the development of a viable downtown for Logansport. The lawn is set up for the United Way kickoff event. When the water level is high, the lower plaza sidewalk becomes a wading area.